SONTAL Trim Shake is specially formulated with “state of the art” ingredients to boost your sustainable energy, increase your metabolism and support general health. To cope with the daily demands of your pressured lifestyle you require more energy. Don’t feel drained by stress. Raise your daily energy levels and maintain a healthy body with SONTAL Trim Shake. You can have all day energy that allows you to perform at your peak. Inhibits fat formation and increases metabolism. 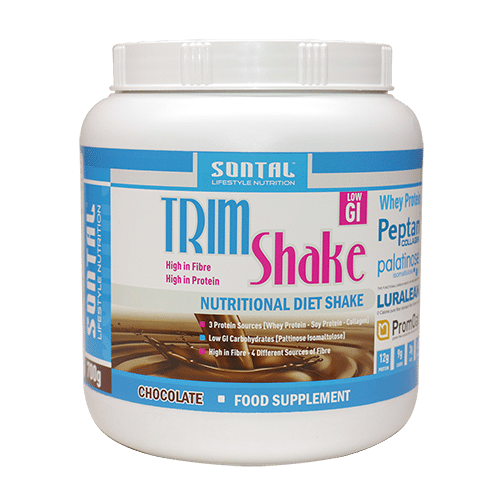 SONTAL Trim Shake is ideal for people on low GI, or low calorie diets, and people looking for healthy sustainable energy. PalatinoseTM a patented low GI carbohydrate with sustained energy release. Peptan bioactive collagen as part of the protein profile. Luralean soluble fibre to help curb cravings. Who could use Trim Shake? People in need of high quality energy during a demanding day. People on a diet plan in need of a high quality low GI shake. Active people in need of sustained energy supply and recovery. People taking part in sport or doing regular exercise. How does LuraLean help with weight loss? LuraLean works as an appetite suppressant in that it expands up to 200 times its original size. LuraLean also has a viscosity greater than 100,000. This means that you have the feeling of being full not long after taking it in. Because LuraLean is a zero-calorie ingredient it helps to greatly decrease the number of calories an individual consumes. Along with causing appetite suppression LuraLean helps to reduce fat by binding and attracting excess oils, calories and cholesterol. LuraLean is a great ingredient to consume before having lunch or dinner to help reduce the number of calories absorbed by the body. A diet high in fiber also helps regulate blood lipid levels making it easier for your body to keep LDL (bad cholesterol) under control. Why does your body need fiber? Fiber is needed to properly digest food and is an important source to promote a healthy digestive system. Fiber attracts water to itself and adds bulk which helps soften stools which also helps for better digestion in lower intestines. Fiber is then fermented in the lower intestines. This fermentation helps the body create and absorb more nutrients and vitamins. Directions for use: Add 3 (three) level scoops (30g) to 200ml water and shake well. Take Trim Shake in place of snack or meal. Use as a dietary supplement with a sensible diet regime.